Kalloy, in Taiwan, has made a number of bike parts to the quality standards that serious cyclists have come to expect. For that reason they have been used as original equipment on many brands of bikes. To gain wider market acceptance Kalloy has odopted for marketing the name "UNO" in the same way their competitor Hsin Lung is using "ZOOM" The quill of the UNO stem is made of 6mm thick aluminum tubing. The top of the quill tube is bored to a depth of 15mm, to enlarge the 10mm hole to 13.4mm so that a recess and cradle is created for the 12.8mm diameter expander bolt head. The top of the quill is cut with a rear downward angle to give the stem a little distinction. The extension is made of ovalized aluminum tubing, near round at the binder tube and vertically oval at the quill. The miter cut at the quill wraps the front third of the quill. The binder tube is made of 2.8mm thick aluminum tubing and has a 10mm hole drilled through it facing into the extension, to relieve heat and pressure at time of welding. The binder fittings are machined from a piece of aluminum rod. The rod is drilled through for the binder bolt, and to make a recess for the bolt head. The rear of the rod is bored to provide a recess for a six sided steel nut that the bolt threads into. The round hole is broached with a six sided punch creating a snug fitting hex hole. The rod is TIG welded to the bottom of the binder tube, then the binder tube and fitting are sawn through to create the cinch system. 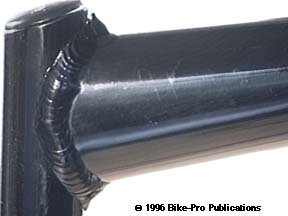 The TIG welds on this stem are, for the most part clean having a small pulsed bead on the sides and top in all areas, but at the bottom where the piece has to be turned over, there is evidence that the wire stayed on a little long. This is cosmetic, not functional. Made of 6061 aluminum, after welding it is heated treated again to bring the metal to T6 hardness, then the stem is epoxy painted in a high gloss Black. The expander bolt is made of chrome plated steel, is 135mm long, with 8mm threads by a 1.25mm thread pitch. The expander bolt has a 6mm allen head and weighs only 50 grams. The binder bolt is made of Black steel and, for a change, has a 6mm allen head, with 6mm by 1mm thread pitch, and is 22mm long weighing 7 grams. 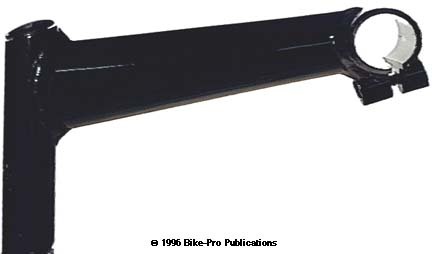 The wedge is made of cast aluminum that is cut, drilled and tapped for the expander bolt. 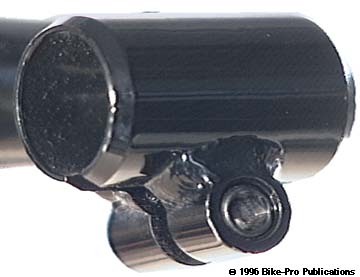 At the top of the quill Kalloy places a snap-in glossy Black plastic cap that closes off the bolt head. The stem has no brake cable routing system, the Ritchey Cliff hanger or DiaCompe equivalent are recommended, look in the Brake section for more information. The Kalloy Mountain single binder stem holds 25.4mm diameter handlebars, has a 15¡ rise, and comes either 120mm, 130mm, 140mm, or 150mm extension length. They are made in a 1" or a 1 1/8" diameter, in Black only. A 150mm long, Kalloy single binder Mountain stem, in a 1" diameter weighs 311 grams.